"Your hospitality and attention to detail are second to none. You made us feel most welcome." Mark and Sarah, West Yorkshire. Warm welcome and superb breakfasts. Enjoyed all the little extras. Will happily recommend The Hilary Guesthouse in Llandudno to family and friends looking for bed and breakfast. You do your industry proud. A+. Stuart and Ros, Kilmarnock. "Thank you so much for the charming room, the good humour and the excellent breakfast. We shall tell everyone for bed and breakfast in Llandudno go to The Hilary Guesthouse". Kevin and Barbara, Tennesse, USA. 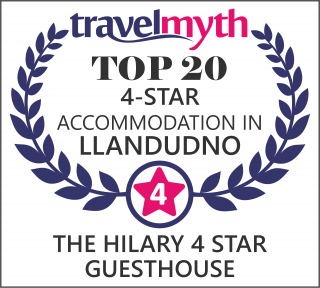 "Must be the 20+ time I have stayed at The Hilary Guesthouse in LLandudno (business trips) over the past 14 months - need I say more????". Mark, Manchester. "The Hilary Guesthouse is a very clean and welcoming guesthouse. Felt the warm atmosphere as soon as we walked in. Beautiful decor throughout. Clean and comfortable. The attention to detail is very impressive. Thoroughly enjoyed the breakfast. You made our stay so special - thank you." Les and Dawn, Queensland, Australia. "Second time at The Hilary Guesthouse in Llandudno. Wouldn't think of going anywhere else. A lovely place. Good points - too many to mention. Bad points - not one". Val and Neil, Bath. "Fantastic week, lovely people, wonderful breakfast - couldn't ask for more". Marilyn and Jonathan, Sheffield. "When looking for bed and breakfast in North Wales we will never look anywhere other than The Hilary Guesthouse", Sheila and Mike, Stoke-On-Trent. A magic place called 'The Hilary'. To when you leave reluctantly. Great service with a smile is free. Once you've tried it you'll agree."